The Division 1-A Football Bowl Subdivision has 128 member teams split between 10 conferences. Every team is allowed only 11 people on the field at a time. Every team starts out with the same number of wins and losses and plays the same number of regular season games. Every team has the same crop of high school students to recruit from. But only half have a chance to make it into the playoffs. Sixty-four teams make up the Power 5 Conferences of the ACC, Big 10, Big 12, Pac 12, and SEC. Three teams are independent of any conference. Sixty-one round out the Group of 5. And woe be unto thee whose program is in that group, for ye shant be playoff bound. The Group of 5 includes the AAC, Conference USA, the MAC, MWC, and Sun Belt. Out of these 61 teams only 4 are ranked. All 4 are undefeated and all 4 would have a chance to finish undefeated if three didn’t play each other. But even if, best case scenario, 2 finished the season without a loss, they wouldn’t be in consideration for the playoff. And so long as only four spots are available, they never will be. The Group of 5 has always been at a disadvantage when it comes to making a major bowl game. Since 2002, there have only been two seasons where a non-Power 5 team was ranked in the top 4 entering bowl season. If the current playoff system had been in place there would have been 10 years where the Group of 5 in its entirety would have missed the playoffs. Let’s call it like it is: Power 5 schools are, overall, much better than the rest of the FBS. For the most part, they are in those conferences for a reason and I would almost always pick an SEC team over one from the Sun Belt. But based on individual programs, the best teams can be identified regardless of their conference. But we know they don’t all have an equal shot. All 61 Group of 5 teams play at least seven conference games, which leaves little scheduling room for a better opponent. And the phrase of the day in college football is a curse for them: Strength of Schedule. 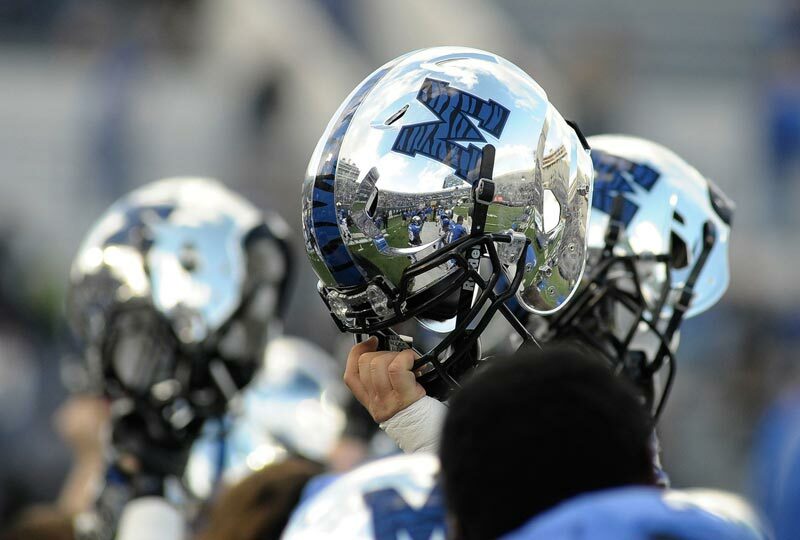 Memphis may be able to beat Ole Miss, but it doesn’t have a chance to play that caliber of opponent every week. And the Selection Committee takes that into account, perhaps now more than ever. If you’re still not convinced that that’s true, then take a look at all of the comments surrounding Baylor’s weak level of opponent to start the season. If Baylor needs impressive wins to quiet the critics of its three 30+ point Group of 5 victories to start the season, what hope does a team with seven such opponents have? Let’s say Memphis goes undefeated. Out of the 4 Group of 5 undefeateds they probably have the best shot at making a playoff spot with their win over Ole Miss. And let’s say that Alabama wins the SEC. Is an undefeated Memphis more deserving of a coveted spot than one-loss Alabama? Or how about a potentially undefeated Ohio State? Michigan State? Clemson? The committee won’t think so. Any of those teams, whether they go undefeated or have one loss (maybe even two for an SEC champion) will be ranked higher than an undefeated Group of 5 school. With one Power 5 conference guaranteed to be on the outside every season, it’s hard to imagine an undefeated Memphis, Toledo, or even often ranked Boise State beating out a second. It’s a double edged sword for those programs. They must play their conference games and are therefore already at a disadvantage. And as we begin to better understand the importance of criteria for the selection committee, Power 5 schools will start to adapt and schedule fewer games against weaker opponents. The first all-Power 5 schedules could emerge. This year the four undefeateds only combine for 7 games against Power 5 schools for the entire season, less than two each. They can’t afford to schedule fewer, but they might not have a choice. So what will it take? How can a Group of 5 hope to achieve FBS glory? Patience. It won’t happen now. Not with only four spots available. But maybe in a few years when the playoff ultimately expands. And perhaps they can make that happen sooner if undefeated schools continue to get left out. But until then they have no choice but to be on the outside looking in. Sam Wicks is a Fordham University graduate and a consistently average fantasy football enthusiast. He was born in Seattle, raised in Boston, and currently lives in New York where his team loyalty is varied, but no less fierce. He loves all things football and track and field related. Outside of sports, Sam is a big fan of plants, dinosaurs, and scuba diving.